The back cover picture shows two views at 150 degree rotation of vitamin B12 conjugated to the potent anti- hyperglycemia peptide glucagon-like peptide-1 (GLP-1). The conjugate displays similar receptor binding and agonism to unconjugated GLP-1, including insulin potentiation from human transplant pancreatic islet cells, which bodes well for oral delivery of GLP-1 through the B12 dietary pathway. For more details, see the Communication by Robert P. Doyle et al. on p. 582 ff. 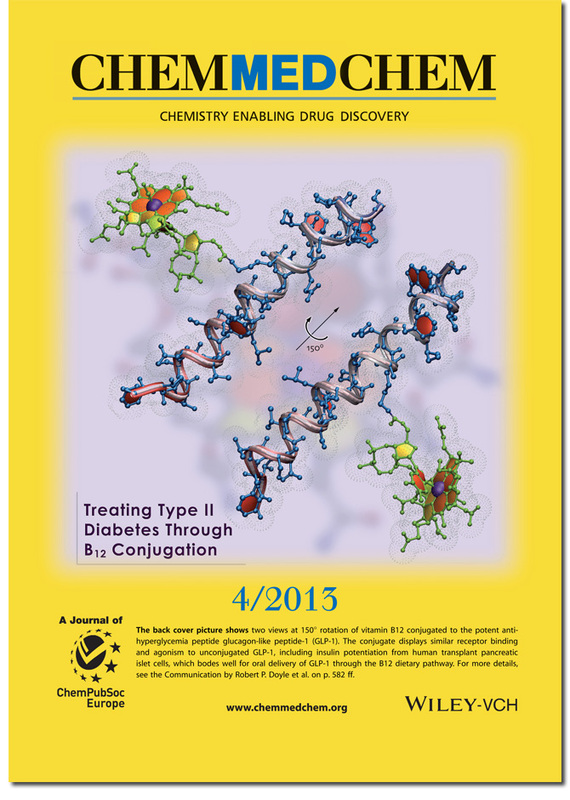 From the free press department… The cover for the April, 2013 issue of ChemMEDChem (just the cover art this time, no theoretical content in the associated article. All the theory’s figured out!). I’m still awaiting the journal’s posting of the article content but wanted to get something up in March. For related content, see the discussion on the “MedChemComm September 2012 Front Cover Image For The ‘Examining The Effects Of Vitamin B12 Conjugation…’ Paper” post or any of the B12-related posts on this site (www.somewhereville.com/index.php?s=b12). This work is similar in scope to the B12-insulin bioconjugate work in the previous studies, but now includes a different peptide (glucagon-like peptide-1) with similar properties.